I wrote this with the bassist Gareth Morgan. I’ve always been a fan of McCartney’s breathtaking bass playing in The Beatles and count myself as a complete Beatle nut. 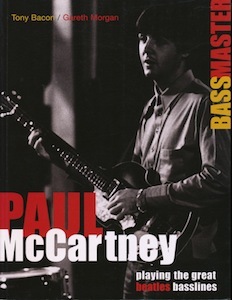 And during the research for the original edition of The Bass Book, I got to interview McCartney, who talked at length about his bass work with the moptops. Of course, that proved to be a mine of great material for this book. Gareth and I had a wonderful time. We sat and listened to every single Beatle recording, including bootlegs, and got right inside the playing. It was a revelation. I thought I knew these records pretty well, but there’s nothing like an intense bout of close listening to tell you all about a player and his methods. That’s what we talk about in the book. Gareth also made some excellent transcriptions for the readers among our readers (if you see what I mean). There are nine of them: ‘Drive My Car’, ‘In My Life’, ‘The Word’, ‘You Won’t See Me’, ‘Rain’, ‘Taxman’, ‘I’m Only Sleeping’, ‘Lovely Rita’, and ‘Dear Prudence’. Does nine strike you as an odd number? Well, it is: there should have been a tenth, ‘Something’, but permission to reproduce that one was declined by the licensor, Harrisongs. We never quite worked out why. I’ve posted an extract from the book from around the classic Sgt Pepper period, which you can get to by clicking the link here. For now, I’ll leave you with three quotes we put on the back of the jacket.